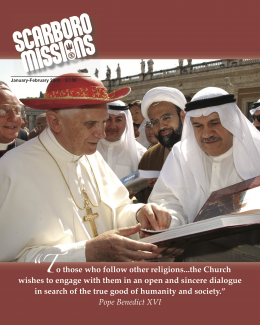 Why is Scarboro Missions involved in interfaith or interreligious dialogue? The question is very valid and I would like to respond to a few of the common concerns that we hear from some of our supporters and other members of the Catholic Church. In this issue on page six, you will find a statement outlining the rationale for our involvement in interfaith dialogue. It is one of our priorities at Scarboro Missions and the statement articulates our mission, vision, and motivation for our involvement in it. Our experience at Scarboro has taught us that many Catholics are unaware of the initiatives of the Popes and the leadership of the Church in the last 45 years since the Second Vatican Council. I invite you to read the articles in this issue and to spend time with the material on “Catholic Milestones in Interfaith Dialogue”outlined in the centrefold. It is a wealth of information and for some I would guess that it might be surprisingly new information. At Scarboro, our commitment to interfaith dialogue has grown for a variety of reasons. First of all, we respond as a Catholic community in mission to the leadership and guidance of the Church beginning with Pope John XXIII to the present. Secondly, we are motivated by our own collective experience in global cross-cultural mission over the last 90 years and our contacts and friendships with many people of other faith traditions where our members have lived and worked. Thirdly, with modern communication, mobility, and immigration we no longer live in isolation from other peoples and religions nor should we live in isolation. Since our founding 90 years ago our world has changed dramatically and so must we. We must come to know and love our neighbour as Jesus taught, but for today’s world. We ought to remember that Jesus engaged in the same kind of dialogue with people of other traditions and beliefs other than his own and even presents some of them as models of faith. My strong expectation is that Christian hope would radiate through to all in every dialogue. It must be a hope that emanates from a deep personal relationship with Jesus and what he is for the Christian. Dialogue in turn must reflect an authenticity in our Gospel witness—we must be followers of Jesus not only in what we say but in the witness of our lives. True dialogue is an occasion for a sincere, honest exchange of beliefs during which the participants listen intently and respectfully with an openness to learn, to understand, and to appreciate the belief of the other. My personal conviction is that it is essential that everyone speaks in the first person singular so that the participants give a personal testimony of their beliefs. If I am speaking with a person of another religious tradition, I express what I believe and I respond to any question as honestly as I can. In a dialogue, one does not dilute or accommodate one’s belief to the listener. If that is the case it really isn’t a true dialogue. Dialogue must be both truthful and respectful. This is very demanding because it challenges me to state in my own words what I believe. It is as if I am invited to respond personally to the question of Jesus, “Who do you say that I am?” Then I begin to speak in the first person about my belief in Jesus, his teaching, and his revelation of God. Dialogue leads to an enrichment of my faith. Pope John Paul II expressed it so beautifully when he said, “By dialogue we let God be present in our midst, for as we open ourselves to one another, we open ourselves to God.” So often in the Gospel accounts we hear Jesus admonishing his disciples to not be afraid or fearful and I believe that we need to have the same trust and openness when we dialogue with another. We believe that one of the goals of interfaith dialogue is a deeper turning to God by each partner in the dialogue. Ultimately, the foundation for all dialogue and missionary activity is the conviction that “mission is first and foremost God’s presence and activity in the world.” It is “missio Dei”—God’s mission. That is the first and primary principle that Pope John Paul II reminds us of in Redemptoris Missio, his encyclical on mission activity. He reminds us that the Spirit of God is the source and author of mission. We are called to participate in an historical project that comes from God and belongs to God. When we do so, we do not begin from nothing for we recall that we live in a world in which the Spirit of God is already operative. God is already present in the peoples, cultures, and faith traditions of others. God is present everywhere before us and salvifically active in ways unknown to us. Fr. Jack Lynch is the Superior General of Scarboro Missions.